Have you ever been in the process of searching for something to "DISCOVER" your thing? Well, like love at first sight: just bang!!! I bought bow, but in my city there was not even a semblance of what is usually called a quiver. 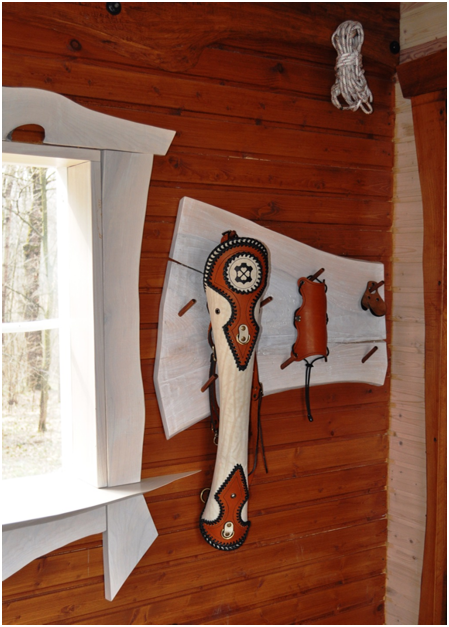 I typed in the search engine "Leather Quiver" (oh, yes, I completely forgot ... it was impatient for me to buy my first quiver made of leather) and, having scrolled through about a dozen photos, I stumbled into this miracle, under the photo of which I write. I "RECOGNIZED" my quiver, so on this photo my quest was over. 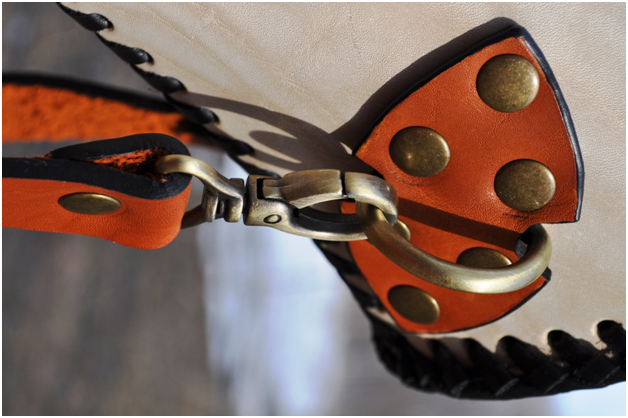 I remembered the smell of leather, how it felt, and how its belts press. I understood that it costs money, but I did not care if only my quiver would come back to me. 1. 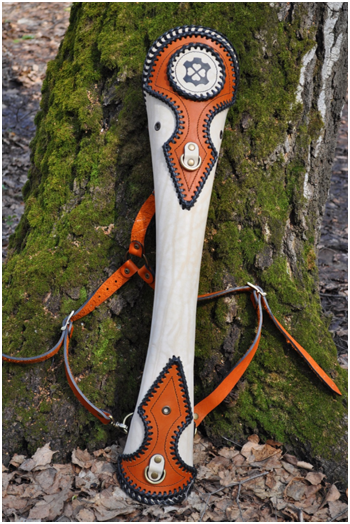 Not just a leather master creates quivers, but a professional archer (agree that you don’t often see such a tandem of a manufacturer and a user in one bottle). 2. I will have to go to Ukraine (good, the road knurled). Mail did not interest me at all, at all, in any way. I decided that I must meet with the person who creates such masterpieces. I wrote a letter to Lucky Leather, which I received a reply in a couple of hours. A day later, we already discussed the details of the quiver in workshop. I emphasize that you will be very kindly met, listened to, given tea and given a consultation of such a level that any Youtube archery chinwag will seem like childish prattle against the background of the information I received in 3 hours spent in the workshop. You will be told and shown everything; they will let you try quivers, bows, arrows, arm guard, belts, etc., and when you run out of questions, you will be shown a correct shooting posture, which (as it turns out later) you actually had no idea. Very pleased with the opportunity to choose anything and mix with anything. This is called "Service Flexibility" - dying out quality in the work to order. 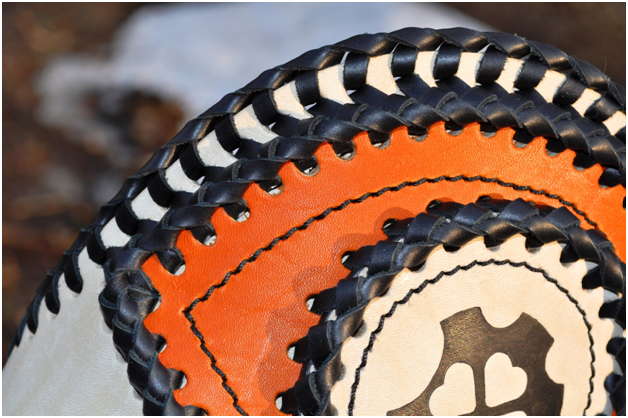 There are no rules, no one twists a finger about a temple and no one hits your hands, if you ask to combine this piece of leather with the braid that you saw in the far corner of the workshop. I was so taken aback of the unlimited opportunity to sew anything that I did not notice, when in the end I returned to the wuiver model with which everything started. If any ideas of improvisation arise during the work, you will be notified and will be offered to deviate from the course towards the improvement of your order. 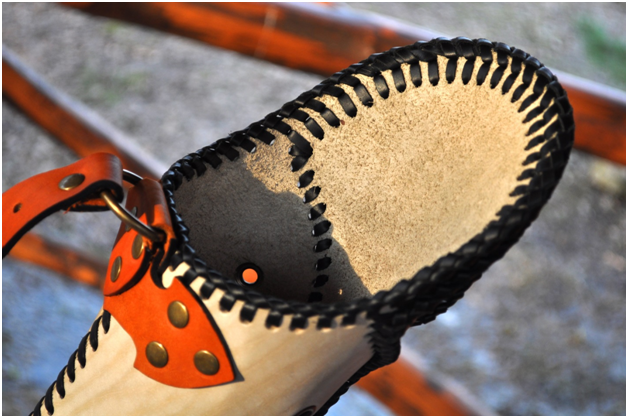 After 2 weeks, I returned to the workshop to pick up my quiver, to smell the leather, how it feels and how its straps press. Feelings of clicking the carabiner behind my back, when the quiver just merged with me into one whole, I see no reason of the letters here. This is the case when a bar is set, when you see such a work level that there will never be a return journey to mass consumption goods (at least in this life for sure). I wanted to write my review the same day, while I felt puppy enthusiasm, but it’s good that I didn’t write it because I would respond only about external virtues. 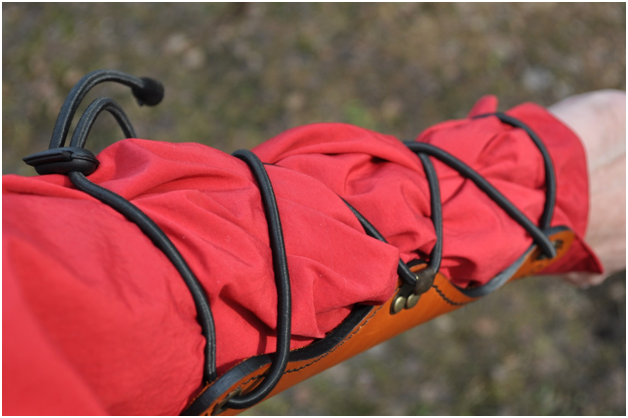 Yesterday I returned home and checked the quiver in combat conditions. 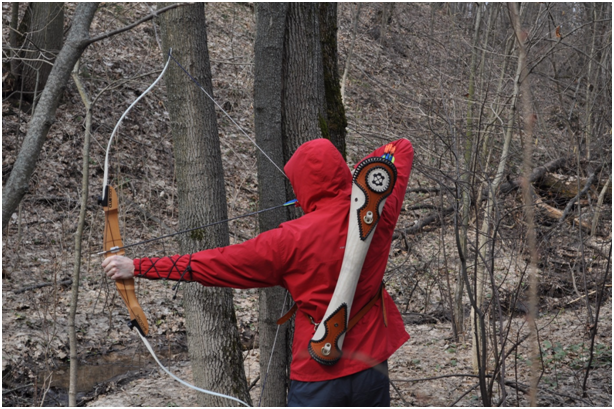 I liked to shoot in the forest, especially in ravines, where you can work out different angles of arrow release, stands and body turns, where the conditions are as close as possible to the fighting, despite the glamorous walk to the target on the lawn cut. 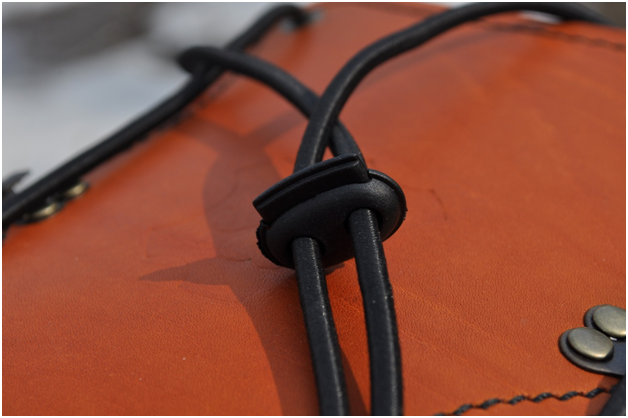 The leather has a beautiful natural texture, it is thick, which keeps its shape perfectly. The stitched parts geometry is impressive. If you want to find fault, then waste time. There is nothing to find fault with, even though you look at it through a magnifying glass. I did not find the brade connection, although there should be several of them. 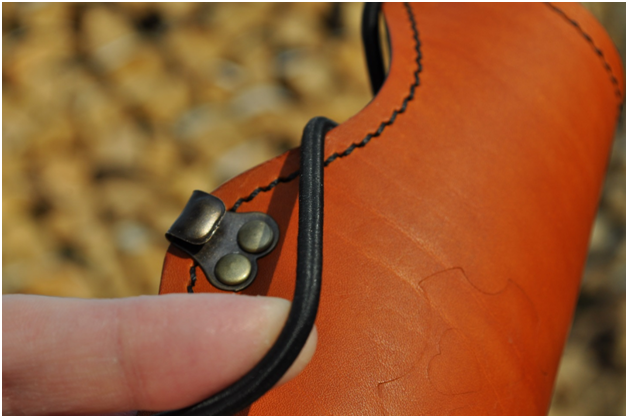 Rings, carbines, grommets and other iron pieces have very high quality, metal is thick, durable, no seams and burrs. 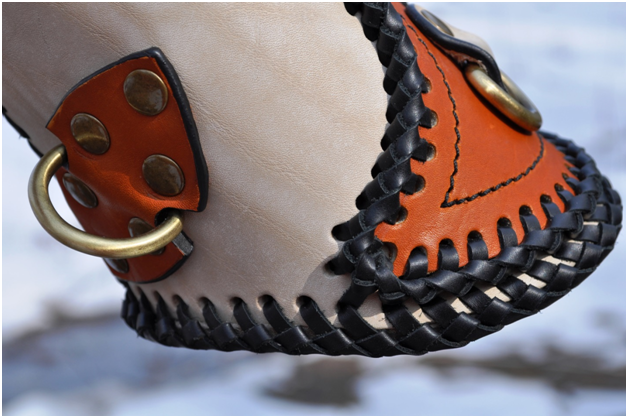 All visible ends of details are highlighted with a black contour for contrast, which decorates the products even more. Adjustment. 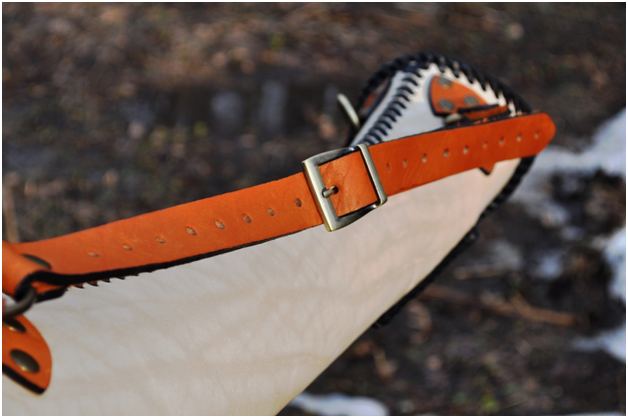 The belts are long and there are a lot of the holes, so you can adjust the quiver by the shape of any body and height. Arrow loading. This hood is just a real arrow catcher. I didn't even have to get used to it. At the first attempt, the hand blindly sends arrows exactly into the quiver. The quiver is anatomically shaped, so it sits perfectly, the arrows do not rattle, but one thing remains a mystery to me. I did not understand why even with a deep tilt of the hull arrows (breaking the gravity laws) do not fall out the quiver. They seem magnetized to it. 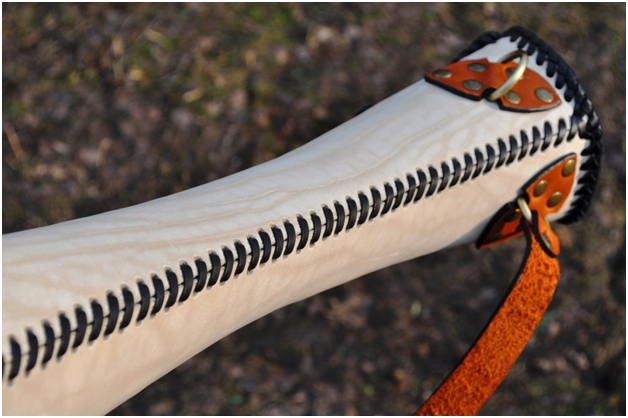 Arm guard (comes with a quiver). 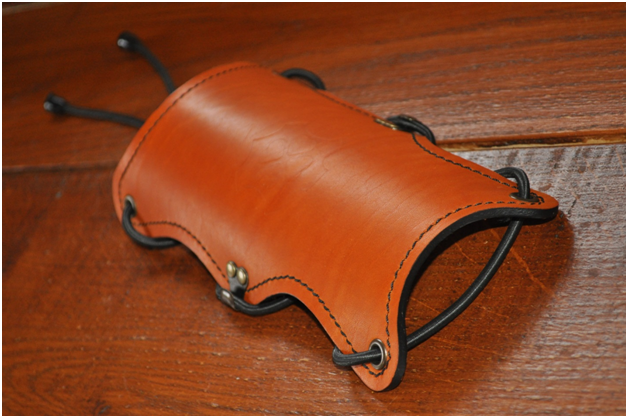 It seems to be just a piece of leather, but look how its shape is thought out. Very pleased with the anatomical cuts along the transverse edges. 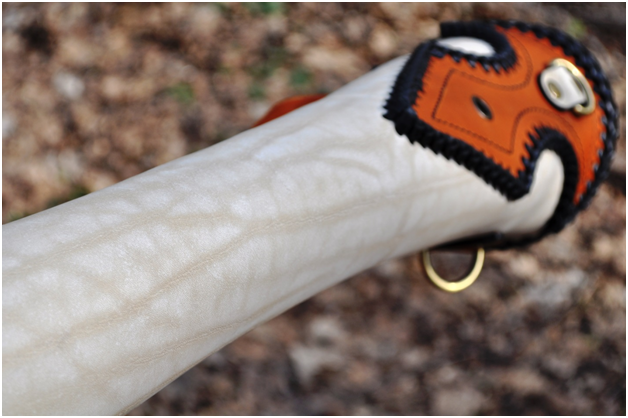 With the crook of the elbow and wrist, the arm guard is perfectly adapts to the arm anatomy. This moment especially impressed me! I would especially note a very comfortable lacing. This is an elastic band, the length of which you pick and fix once with your arm's thickness and type of clothing. 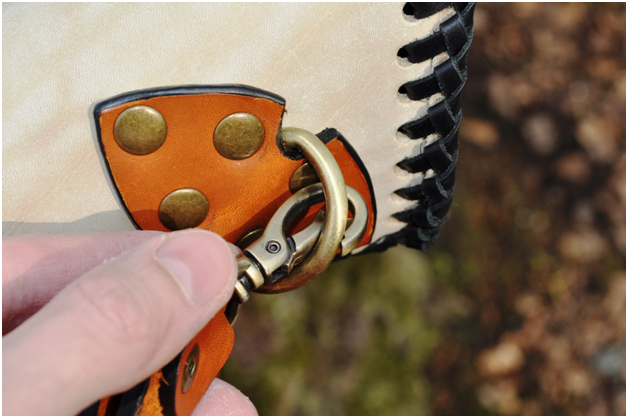 The secret is in two intermediate hooks (may the master forgive me, if I call accessories wrong), which allow me to put on an arm guard for 3 seconds. 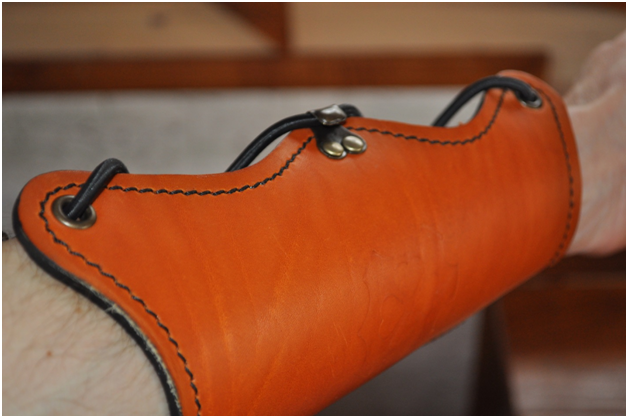 Wearing arm guard just looks awesome as a leather part, and from the lacing. Quiver and arm gurad sizes. Photos absolutely do not convey their true size. Just seeing them put on a person, I was stunned how huge they are. The 32nd arrow barely protrudes from the quiver, and arm guard covers almost the whole forearm, even with my height 188. I believe that if you do something in life, then either do your best 100% or not at all. 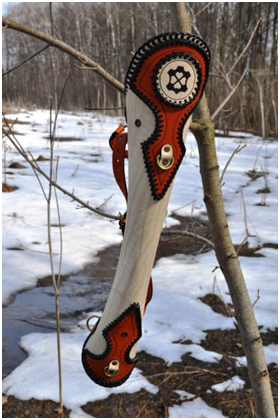 Having made this quiver, the master definitely laid out in full, and in my opinion my arrows began to fly more precisely))) Thank you, Lucky Leather!